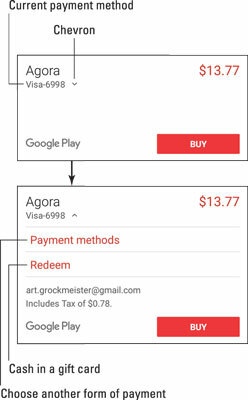 To purchase an app or media on Google Play from your Android phone, you tap the BUY button. A card appears, listing your preferred payment method, such as the example shown here. For security, you’re prompted to type your Google password. It is strongly recommended that you do not choose the option Never Ask Me Again. You want to be prompted every time for your password. Type the credit card’s security code. This is the CVC code, found on the back of the credit card. The app is downloaded or the media made available to your phone. To select another payment method, follow these steps when the Buy card is presented, and tap the chevron by the current payment method, as shown. The Buy card expands, illustrated at the bottom of the figure. Choose Payment Methods and select another credit or debit card or use your Google Play balance. After another payment method is selected, continue with Step 1. If you’ve not yet set up a payment method, the chevron appears by the item’s price, not below the item purchased, as shown. Tap that chevron, and then choose a payment method. You can add a credit or debit card, bill via your cellular provider, use PayPal, or redeem a Google Play gift card. After you purchase the item, it’s made available to your phone. Apps are downloaded and installed; music, eBooks, movies, and videos are available but not necessarily downloaded. The credit or debit cards listed in Google Play are those you’ve used before. Don’t worry: Your information is safe.